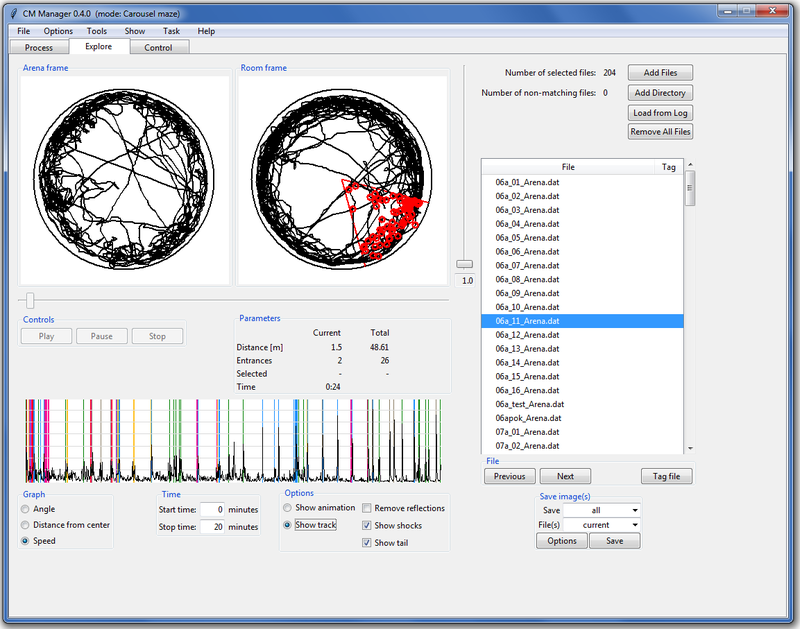 Carousel Maze Manager (CMM) is a program for analyzing data from widely used behavioral neuroscience tasks – Morris Water Maze, Open Field, and Carousel Maze. 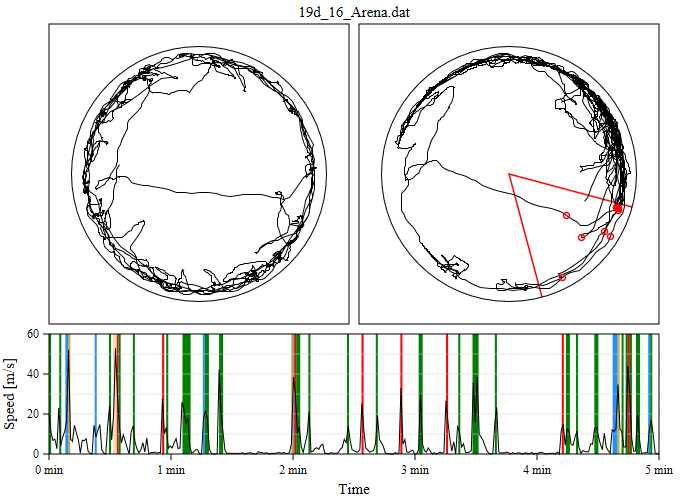 The program is open source and is written to make reproducibility of analysis easy. It can be found here. CMM has already been used in several published papers. CMM is currently in an alpha version 0.4.0. Download and install Python 3 (default settings are okay). Download and unzip Carousel Maze Manager. The use should be generally intuitive and straightforward. There are three main parts of CMM – Process, Explore, and Control. 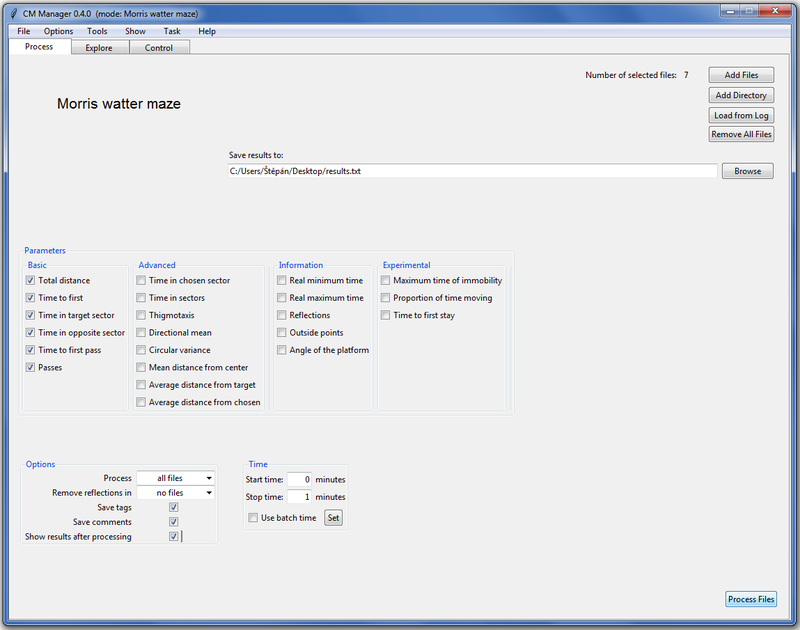 In Process, you can compute many different parameters for each task. The parameters can be customized in Options (menu bar). In Explore, you can view an animation of a session or a track. 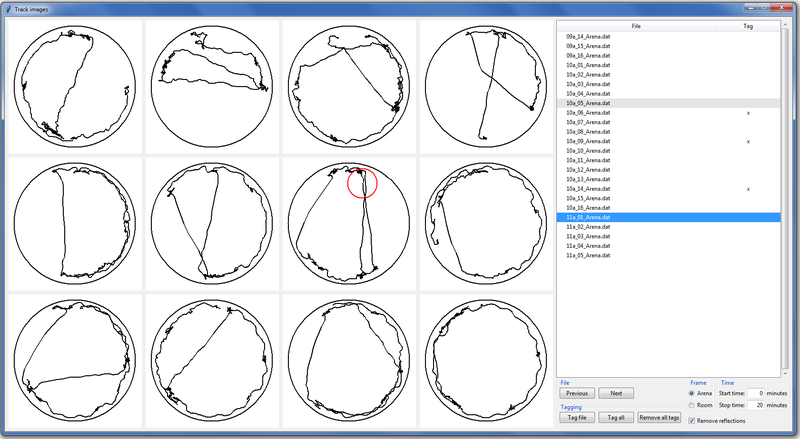 Explore also graphs various parameters and you can save images of the graphs and/or tracks there as well. In Control, you can check data files for reflections, data points outside of the specified area, and missing data points. Data files can be also checked using the Show tracks feature (Show in the menu bar), where the track can be easily inspected and manually corrected to remove reflections. To help working with complex datasets, CMM features tags and comments. Tags can be used for separate analysis or treatment of selected files. Both tags and comments can be saved in results of analyses and they are automatically saved in log files. 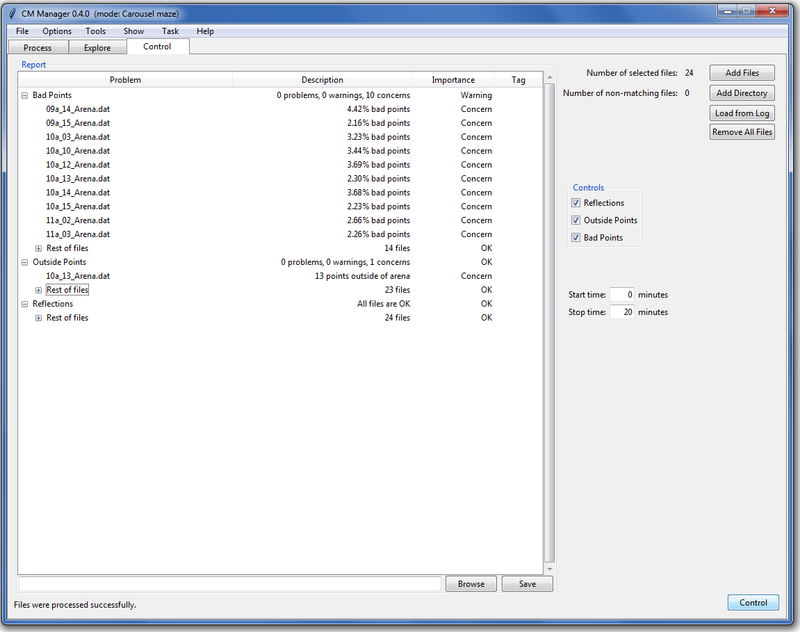 CMM has one file storage for each task. The file storage contains information about paths to the files that were added to it. It also contains comments, tags, and manual corrections to the files. Files can be added to the file storage using Add Files, Add Directory, and Load from Log buttons (logs are automatically saved during each analysis in the Stuff/Logs folder). The file storage can be seen using the Show files feature (Show in the menu bar). The file storage can also be saved and loaded in the File menu in the menu bar. Some features (e.g., commenting) may be somewhat hidden. These features are usually accessed using the right mouse button (this works on files in file trees, parameters in Process, graphs and Parameters in Explore, and tracks in Show tracks. Please cite the program if you use it for analysis in your paper. I develop the program in my free time, and I do not have any money from it. The citations can at least show me that the program is useful and motivate me to further develop it. Please report me any possible bugs at bahniks@seznam.cz. While the development of CMM is currently rather slow, I try to remove bugs as soon as possible. CMM currently saves information about errors in a file named according to the time of the analysis session in the Stuff/Bugs folder. Sending me the error file can help me reproduce and correct the bug.